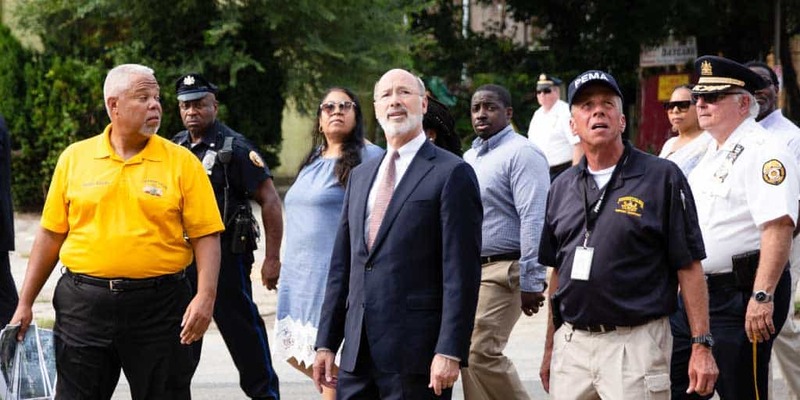 Harrisburg, PA – Governor Tom Wolf today announced that the federal government has granted his request for Public Assistance to reimburse state agencies, county and municipal governments and other eligible private non-profits for costs associated with severe storms that brought heavy rainfall and severe flash flooding to parts of Pennsylvania from August 10 to 15, 2018. Public Assistance was awarded to the following counties: Bradford, Columbia, Lackawanna, Lycoming, Montour, Schuylkill, Sullivan, Susquehanna, Tioga and Wyoming. The governor’s request for Individual Assistance, which would make a variety of programs available to citizens to meet their recovery needs, is still under review by the Federal Emergency Management Agency (FEMA). Through the Public Assistance program, applicants can be reimbursed up to 75 percent of the costs incurred on eligible expenses, such as but not limited to: costs associated with paying overtime, repairs to damaged infrastructure, equipment rentals and materials. Over the coming weeks, staff from the Pennsylvania Emergency Management Agency will hold meetings with applicants to thoroughly review all application documentation before forwarding it to FEMA. The process is expected to take several weeks, and all reimbursements are handled electronically.